Background: Although ductal stenting (DS) has been performed in patients with severe congenital heart disease in Japan, the frequency of DS performed in Japan remains unclear; moreover, no stent has been approved for arterial duct (AD) under Japanese health insurance (JHI). Methods: The Health Insurance Committee of the Japanese Society of Pediatric Interventional Cardiology conducted a questionnaire-based survey to investigate the current status of DS performed and its necessity in Japan and evaluated the efficacy and safety of the procedure to seek approval for its use under JHI. Results: DS was performed in 64 cases at 12 institutions between April 2013 and March 2016. A total of 62 DS were performed for restoring the systemic circulation in patients with hypoplastic left heart syndrome, subaortic stenosis with interrupted aortic arch, and others. The three major indications for performing DS were high risk of alternative surgery such as the Norwood procedure, urgent procedures owing to the closure of AD, and based on own institutional principle. Complete success was achieved in all the 62 procedures, and prostaglandin E1 was withdrawn in 60 cases (97%). Major complications included stent migration/embolization in 6 cases (9.7%), 4 of which were replaced using a balloon, and dissection in 3 cases (4.8%). Mortality related to the procedures or complications was absent. Majority of the patients reached the next stage surgery. Conclusions: The present study strongly recommends that both balloon-expandable and self-expandable stents must be approved for the safe and effective ductal intervention under JHI as soon as possible. At present, Sinus-SuperFlex-DS stent is available for DS mainly in European countries, which is the only one approved for arterial duct (AD) in the world.11) Therefore, in the countries where this stent is not available, DS is performed using off-label stents for peripheral vessels, renal artery, or biliary duct, as with a situation of a nonlicensed drug use in different settings worldwide. Concerning the situation in Japan, DS has been frequently performed in patients with HLHS and other congenital heart diseases with duct-dependent systemic circulation; however, no stent has been approved for AD under Japanese health insurance (JHI).12, 13) Therefore, in the present study, we conducted a questionnaire-based survey to investigate the current status of DS and its necessity in Japan in routine clinical practice and to seek approval for its use under JHI. The Health Insurance Committee of the Japanese Society of Pediatric Interventional Cardiology (JPIC) conducted the survey and evaluated the efficacy and safety of the procedure. A well-structured, validated, multiple response type questionnaire regarding DS procedures performed during the three years between April 1, 2013 and March 31, 2016 was sent to the JPIC managers of all the 35 institutions in August, 2016; we received the completed questionnaires from responding institutions by October 31, 2016. The questionnaire contained 23 items including patient characteristics: age in days, gender, anthropomorphic data (weight and height) at stenting, therapeutic indication, established medical diagnosis, associated comorbidities, previous surgical intervention, previous catheter intervention, use period of prostaglandin E1 (PGE1) before stenting; stenting: size and configuration of AD, approach site, how to deliver and implant the stent, the kinds of stent, guidewire, and sheath, usage of other balloon to remount the stent, procedure achievement, complications, peripheral oxygen saturation before and after stenting, flow velocity measured by pulsed wave/continuous wave Doppler before and after stenting; and outcome: withdrawal of PGE1, and outcome (Table 1). Responses to the questionnaire were aggregated for analyses by December 31, 2016. Describe specifically if additional stenting was performed later date A Genesis stent (1560) was additionaly implanted from the right femoral vein because the pulmonary end of the arterial duct became narrow. The contents in case yes Stent migration to the main pulmonary artery; Hypotension, which was recovered after epinephrin IV, etc. How to deal with it The migrated stent was recaputured with a 8 mm×2 cm Saber balloon catheter and it was placeed at the target site. Whether or not did the patient reach the next stage surgery? What was the next stage surgery? All data are expressed as the mean values with standard deviation or median values with ranges. Student t-test and chi-square test were performed for continuous variables and categorical data, respectively. All the analyses were performed using SPSS software (SPSS, Chicago, IL, USA). For two-tailed hypothesis, p<0.05 was considered to be statistically significant. We received the replies from 28 of the 35 institutions. Of these, DS was performed in 64 cases at 12 institutions in the three years. The purpose of DS was to maintain systemic circulation in 62 cases and to do pulmonary circulation in the remaining 2 cases. Therefore, we describe DS performed for maintaining systemic circulation in these cases. 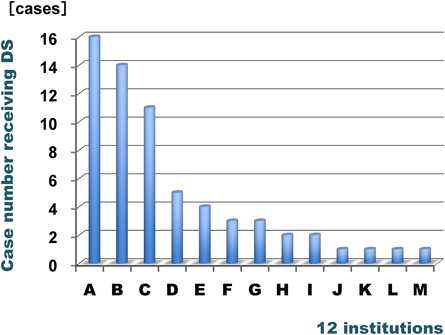 The number of DS procedures in each institution is shown in Fig. 1. The top three institutions performed >10 procedures during the 3 years. Table 2 represents the characteristics of 62 patients having undergone DS. Major indications for performing DS were patients with a high risk for alternative surgery such as Norwood or urgent stenting owing to the closure of AD despite of the use of PGE1; the percentage of DS performed because of these indications was 82%. However, DS was also performed based on each institutional principle (18%). In this setting, the patient does not always have a high risk for the alternative procedure. Patient diagnosis indicates that approximately 63% of the patients exhibited univentricular physiology, and the remaining had biventricular physiology. The median age and weight of the patients at the time of DS were 21 days old and 2.8 kg. Bilateral pulmonary artery banding was performed prior to DS in 38 cases (61%). Catheter interventions were performed prior to DS in 15 cases (24%), which included balloon atrial septostomy in 10 cases with univentricular physiology, balloon aortic valvuloplasty in 4 cases with critical aortic stenosis, and pulmonary artery band dilation in 1 case. Table 3 shows characteristics of the ADs and the 62 implanted stents. The mean maximum diameter and length of ADs were approximately 6.5 mm and 13 mm. The mean diameter and length of the stents were 7.4 mm and 17.2 mm relative to the size of ADs. Most of the stents were balloon expandable, and the majority of them were the products of Express Vascular and Palmaz Genesis. Table 4 shows how to deliver and place the stents, the results of them, and outcomes following stent implantation. Twenty four DS were implanted by hybrid procedure (39%), whereas the remaining were implanted by percutaneous procedures (61%). For percutaneous procedures, the predominant access site was the femoral vein, and methods for stent delivery included back loading way, bare delivery, and venous-artery wire loop. All the 62 procedures achieved 100% success rate, and PGE1 was withdrawn in 60 cases (97%). In the remaining two cases, the uncovered parts of ADs became constricted after the withdrawal of PGE1, which was due to stent migration toward the main pulmonary artery in one case, and PGE1 was restarted until Norwood procedure was performed in one case, and Norwood and bidirectional Glenn procedure was performed in the other case. Major complications occurred in 10 cases (16%). Stent migration or embolization occurred in 6 cases (9.7%). In 4 out of the 6 cases, stents migrated to the main pulmonary artery, and in the other two, stents migrated into the descending aorta. In 4 of these 6 cases, stents were correctly repositioned using a balloon catheter, whereas in the remaining 2 cases, stents were left where the stent migrated. In one case of the 6 cases, stent migration occurred following cardiac massage for recurrent transient bradycardia. Except for this case, the mean diameter of the 5 stents which migrated was only 0.04 mm larger than the mean maximum diameter of the ADs, whereas that of the 56 stents which did not migrate was 0.93 mm larger than that. There was no statistically significant difference between the two groups. Dissection was recognized in 3 cases (4.8%), including AD, descending aorta, and main pulmonary artery. In 1 of these 3 cases, dissection of the descending aorta was recovered by an additional stent. During the period from DS to the next stage surgery, additional treatments were also performed, which included additional stenting in 2 cases, stent redilation in other 2 cases, and continuation of PGE1 in the remaining 2 cases (described above). There was no mortality associated with the procedures or complications. Outcomes of the 62 cases included Norwood and bidirectional Glenn procedure in 11 cases, Norwood procedure in 20 cases, biventricular repair such as Yasui procedure in 15 cases, waiting for the next stage surgery in 11 cases, death from the underlying heart disease in 1 case, and death from other non-cardiac diseases in 4 cases. Except for the 11 cases waiting for the next stage surgery, 46 of 51 cases reached the next stage surgery (90%). No study has directly compared outcomes between primary Norwood and hybrid procedures in Norwood-high-risk neonates with HLHS in the same institute. However, hospital mortality after primary Norwood procedure for Norwood-high-risk neonates with HLHS is approximately 45% in institutes where the survival rates after primary Norwood procedure is >90%.3, 4) Whereas, in the institute in Giessen, where primary hybrid procedure was performed most in the world, hybrid procedure has been performed in all neonates with HLHS since 1998, and the survival rate at 5 year in Norwood-high-risk patients with HLHS is >80%.10) These results may indicate that hybrid procedure has better outcomes than Norwood procedure for Norwood-high-risk neonates with HLHS in institutes where these interventions are frequently performed. The finding of this survey indicates that in the majority of institutes in Japan, DS for restoring systemic circulation is urgently needed and is usually performed using off-label stents in approximately 20 patients per year, who are presented with a serious congenital heart disease including HLHS, univentricular heart, and severe subaortic stenosis with interrupted aortic arch. The indication for DS includes not only high risk of alternative surgery such as Norwood operation particularly in neonates and/or crucial procedure due to the closure of the AD in spite of using PGE1 but also based on own institutional principle. This indicates that in such institutes, a hybrid approach comprising DS is performed as a basic procedure in patients with standard risk for Norwood procedure. The mean length and diameter of selected stents in 62 cases were 17.2±2.6 mm and 7.4±1.2 mm for the AD with a mean length and maximum diameter of 13.0±3.5 mm and 6.5±1.5 mm so that each stent covered the whole arterial duct without migration. The major complication associated with DS was stent migration or embolization. In this study, the mean diameter of the 5 stents which migrated was only 0.04 mm larger than the mean maximum diameter of the ADs, whereas that of the 56 stents which did not migrate was 0.93 mm larger than that. To prevent stent migration, it was highly recommended to select a stent with a diameter 1 to 2 mm larger than the maximum AD diameter, although this is in the case of self-expandable stents.11, 14) Although self-expandable stents are primarily used in Europe and North America, stent migration or embolization was recognized with a frequency of 2.5%–14%.9, 14) It is believed that this complication tends to occur during the early period in the learning curve of the institutes. Recently, Sinus-SuperFlex-DS stent with CE mark for ADs has been introduced for routine use in Europe. Besides, this self-expandable stent is available in a variety of sizes and can be delivered with the 4 Fr. system. This stent is specifically designed to accommodate the soft curvature of the AD to facilitate physiological flow, reduce complication rates, and allow easier surgical removal at the time of arch reconstruction.11) In contrast, in Japan, balloon-expandable stents have been mainly used for DS because there are hardly self-expandable stents that fit into neonatal AD. Stents of Express Vascular and Palmaz Genesis are the most widely used because of their flexibility and variety of available sizes. Notably, in the case of accompanying coarctation of the aorta, DS using side cell dilation is an effective procedure. The Palmaz Genesis stent with a closed-cell design with interposed sigma hinges has an advantage to enable a side cell more largely dilated over Express Vascular stent because the former has a sigmoid structure of hinges of struts, and the sigmoid parts are elongated into linear when the side cell was dilated with a balloon.12) The side cell dilation technique is particularly useful if a stent migrates distally resulting in the stent covering the junction to the isthmus of the aortic arch. To achieve long-term safety of DS, a balloon expandable stent and also a self-expandable stent with optimal flexibility must be approved for use in AD because the AD has various configurations including no waist, strongly constricted, large and long, and accompanying coarctation of the aorta; furthermore, circulation becomes easily worsened, especially when hard materials are used in neonates with univentricular physiology. In Japan, DS for restoring systemic circulation is needed in patients with severe congenital heart disease including HLHS, univentricular heart, and subaortic stenosis with interrupted aortic arch. The present study strongly recommends that both balloon-expandable stent and self-expandable stent must be approved for the safe and efficient intervention of AD under JHI as soon as possible. We thank the JPIC managers who cooperated on this survey in the 28 institutions; Sakakibara Heart Institute, National Center for Child Health and Development, The University of Tokyo Hospital, Tokyo Metropolitan Children’s Medical Center, Toho University Omori Medical Center, Toho University Ohashi Medical Center, Showa University Northern Yokohama Hospital Cardiovascular Center, Shizuoka Children’s Hospital, Seirei Hamamatsu General Hospital, Chukyo Hospital, Mie University Hospital, National Cerebral and Cardiovascular Center, Osaka City General Hospital, Osaka Women’s and Children’s Hospital, Hyogo Prefectural Kobe Children’s Hospital, Okayama University Hospital, Kurashiki Central Hospital, Hiroshima City Hiroshima Citizens Hospital, Shimane University, Tokushima University, Fukuoka Children’s Hospital, Kyushu Hospital, Okinawa Prefectural Nanbu Medical Center. The authors have no financial conflicts of interest to disclose concerning this study or the manuscript.